This week I went out to eat several times. In an effort to make better choices, I chose salads at every place I went to. 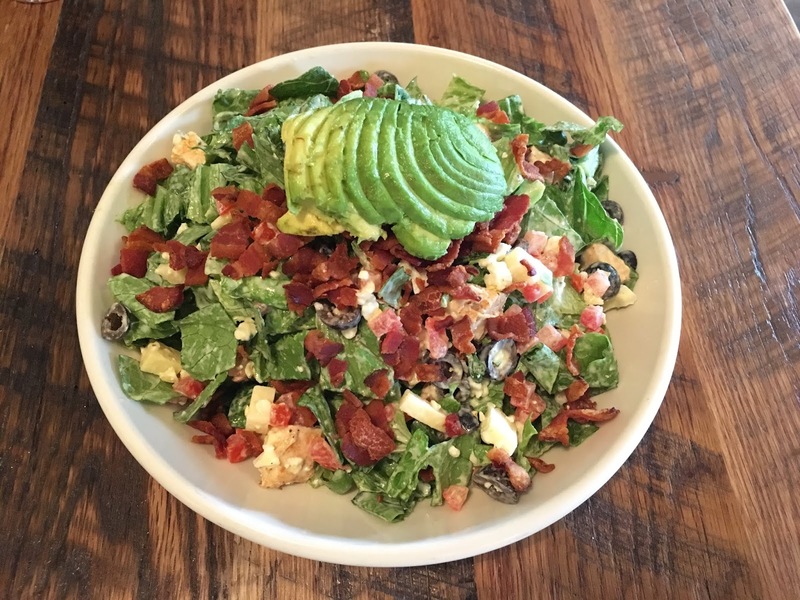 I had the Classic Cobb Salad in the photo above (romaine lettuce, blue cheese crumbles, avocado, all-natural nitrate/nitrite-free bacon, all-natural cheddar cheese, tomatoes, black olives and hard-boiled egg with ranch dressing) at Burgers and Greens. I had athe Savannah Chopped Salad (romaine lettuce, grilled chicken, dried cranberries, Gorgonzola, honey roasted almonds, tomatoes, and cucumbers) at McAlister's Deli. I had the Enlightened Kale and Roasted Brussels Sprouts Salad (Baby kale, herb-roasted brussels sprouts, romaine, blueberries, red grapes, dried cranberries, goat cheese, cucumber, candied pecans, toasted pepitas and red onions tossed in strawberry vinaigrette.) at BJ's Brewhouse. I chose the Garden Kale Salad (grilled chicken, kale, heirloom tomato, asparagus, avocado, pine nut, parmesan, lemon tahini vinaigrette) at Culinary Dropout. And last but not least, one of my favorite salads - the Spicy Thai Salad with Chicken (chicken, romaine, roasted cashew pieces, fire-roasted edamame, red pepper and carrot blend, cilantro and wonton strips tossed with low-fat Thai chili vinaigrette and drizzled with peanut sauce) from Panera Bread. I usually pair this salad with a cup of their black bean soup. Yum! I've enjoyed the salads, and my only complaint is that a few of them had too much dressing. I'll have to remember to order it on the side in the future. I don't like my greens drenched. All this salad eating is another attempt to drop some weight. I've been spectacularly unsuccessful since my big attempt to do better two years ago, but I'm going to try again. One of these days I'll get it right!